Thousand of Russians has come to central Moscow today to say "Goodbye!" to Pyotr Fomenko, Russia's prominent theater director and founder and artistic director of the Pyotr Fomenko Workshop Theater, who passed away at the age of 80 last week. "Pyotr Naumovich's death has left me feeling like an orphan. And everyone in his theater, and I think the whole of the Russian theater world has been left orphaned. When he was alive, we knew that there was a bar to which we could set our sights. When you watched or listened to something at the theater, you would always be thinking ‘Pyotr Naumovich would have done that better and more subtly,’" said Yevgeny Kamenkovich, a student of Fomenko’s. "He listed a huge number of plays that needed to be put on - a list that would require 100 years to produce. How are we going to manage to do this now?" Kamenkovich said. Pyotr Fomenko’s shows won many different theatrical prizes including: the Stanislavsky Prize (1994, 2000), the Crystal Turandot Prize (1994, 1996), the Golden Mask National Theater Prize (1995, 2001, 2002, 2006, 2012), and the Tovstonogov Prize (2001). In 2001, Fomenko was awarded the Triumph Prize for his contribution to culture and the arts. Fomenko was honored with many awards and titles for his work. He is a People's Artist of Russia (1993), A State Laureate Prize Winner of the Russian Federation (1995, 1998, 2002). He was awarded the Order of Merit to the Motherland IV, III and II Degree (1996, 2003, 2007) and in 2004 he was awarded the President's Prize of the Russian Federation. Fomenko himself described his work as follows: "Theater direction is not something that can be learned, you can only enrich and preserve those qualities that are naturally inherent within an individual and equip them with an arsenal, which should be constantly changing throughout life - constantly being enriched and modified." Actor Valentin Gaft said of him: "Pyotr could have put on a show based on the telephone directory, not because of the names, surnames and addresses contained in it, but because it contained living people - the sick, the healthy, the lovesick, the happy, the bitter, those who have ended their lives and those who have returned to life, the children, the adults, the old men and the old women. This was Pyotr's sort of material. Pyotr understands life." On the eve of his 80th birthday last year Fomenko gave an interview with Rossiyskaya Gazeta about Russian politics and society: "To love sometimes means hating and refusing to tolerate something that is evil. You see, this is the secret of this patriotism, which is being trumpeted from morning till night these days. We are all looking for a national idea. Utter drivel. It starts out as a national idea and ends up as a Nazi idea. There is nothing more terrifying today that this nascent Nazism in my own homeland." Pyotr Naumovich Fomenko was born in Moscow on July 13, 1932. It is difficult for many people today to imagine that the founder of the Pyotr Fomenko Workshop, with its reputation for being almost the last living bastion of the tradition of Russian psychological theater, himself broke with all traditions and systems. He was a football fanatic, a seeker of adventures in the hidden courtyards and backstreets around his home on Yakimanka Street and a survivor of World War II. One journalist recalled Fomenko telling him a story about catching pigeons by soaking bread in pure alcohol and then bringing them home to his mother during the war years. Fomenko’s mother played an important role in his development as an artist, encouraging him in his love for music and the theater. He left school to study acting at the studio school of the Moscow Art Theater, but was expelled in his third year for “a disregard for the great school of Russian theater." He eventually graduated from the linguistics faculty of the Pedagogical Institute and was accepted into the directing program at the State Institute of Theatrical Arts (GITIS). He graduated from GITIS in 1961, and during the 1960s, he put on plays in a number of Moscow's theaters including the Central Children's Theater, the Malaya Bronnaya Theater, Moscow State University's Leninskiye Gori theater studio, the Mayakovsky Moscow Dramatic Theater and the Taganka Theater of Drama and Comedy. Eventually he got in trouble with the censors and he was forced to leave the capital, first for Tbilisi and later for Leningrad, where he became the head director of the Leningrad Theater of Comedy in 1977. During these years he also occasionally returned to Moscow to put on shows at the Soviet Army Theater and the Maly Theatre. In 1981, he left the Leningrad Theater of Comedy in 1981 and began to teach in the directing department of his alma mater, GITIS. He continued to put on plays in Moscow's theaters and in 1992, he was awarded the title of Professor of the Russian Academy of Theatrical Arts. In 1993, the graduates of Fomenko's acting and directing course formed a theater known as the Pyotr Fomenko Studio Theater and Fomenko became the theater’s artistic director. In 2000, he went to teach at the Paris Conservatory. He later put on a show at the Comedie-Francaise (2003), and in 2005, at the Chekhov Festival in Moscow Fomenko directed "The Forest" by A. Ostrovsky using actors from the Comedie-Francaise. Fomenko saw his final class of students graduate in 2001. In 2003, he retired from teaching. 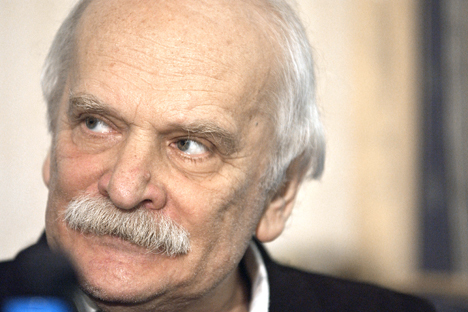 During his long career, Fomenko put on over 60 plays in theatres in Moscow, Leningrad, Tbilisi (Georgia), Wroclaw (Poland), Salzburg (Austria) and Paris (France). This story is based on reporting by Rossiyskaya Gazeta,RIA Novosti and Gazeta.ru.